Zamari Pierre-Louis was killed in Miami Gardens. His mother Sherita Smalls and brother Fabian Johnson say the 16-year-old brought the family so much joy. WLRN is looking at the impact of children and teens killed by guns in South Florida through the voices of some of the people who are most affected. Zamari Pierre-Louis was 16 years old when he was shot and killed in Miami Gardens on January 17, 2014. Five years later, his killing remains unsolved. Pierre-Louis was a student at Hialeah-Miami Lakes Senior High. He wanted to become a preacher like his mentor Pastor Billy Strange at Mount Calvary Missionary Baptist Church. 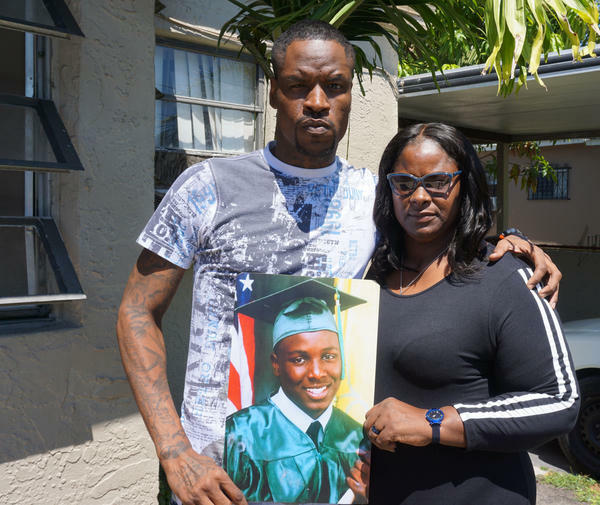 His mother Sherita Small and older brother Fabian Johnson talked with WLRN reporter Nadege Green about keeping Zamari's memory alive five years later. SHERITA SMALL: Zamari was 16. He had just done his trial sermon at church, Mount Calvary Missionary Baptist Church, located in Liberty City. That’s something he always wanted to do. And the trial sermon means like, before being pastor, they give him a chance to preach. He had preached and it went very, very well. Zamari was a loveable person and he also loved Pastor Strange, the pastor at the church, because the pastor took Zamari under his wings. FABIAN JOHNSON: One time I was at work, not knowing that the deacon at my mama's church is a supervisor at my job. Me not knowing that this was him or nothing, he just come back there and was talking about this person. “I got this young man that goes to my church...” and then he just messed around and said, “Zamari.” And I was like, "Man, that’s my little brother." SMALL: He felt like if he wasn’t in church, he’d be missed, 'cause that’s the kind of person he was. If he wasn’t there, "Oh, Zamari is missed." Which, let me tell you, they knew when he wasn’t there though. In Miami Gardens, that’s where it happened. In Miami Gardens. Me and Zamari were just sitting down talking and he talking bout, "Mama, I’m going up the street." I’d say about 30-35 minutes later somebody came and knocked on my door and said Zamari got shot. I wasn’t expecting him to—I thought he just got shot. JOHNSON: I was laying in the bed watching a Miami Heat game and Lebron James, he had done just did a crossover. He was about to go to the hoop and lay the ball up, but he got fouled. As soon and he got fouled, my phone rings. It’s my mama. All she said was "Zamari got shot." So I just hopped up and got in the car. SMALL: They were saying, "It’s somebody dead in the street." I’m not expecting for that to be my son, you know. Zamari's dad had just passed away in Haiti. I let him get a tattoo, something he’d been begging for and that’s how they identified him...by the tattoo. JOHNSON: That’s a feeling that stay for the rest of your life. Just knowing your brother went through that pain and you weren’t there to help him or nothing. And just knowing he was there by himself, that just hurt me real bad. I even went down there to the morgue and I begged the lady real bad to see the pictures of my little brother. And she let me see the pictures and stuff and I sat in there for like two hours just staring at the pictures and crying. SMALL: The after is something. It’s like your whole life done changed. Everything in your life - the way you move, the way you don’t move. The way you do this, the way you do that. It’s like your whole entire life changed. Since Zamari passed, I go through depression. I done gained a whole bunch of a weight. I go to a psychiatrist. Things I’ve never done before, I do them now. I still have all of his clothes. JOHNSON: His clothes and his shoes just smell like him so much. It makes you feel like his presence is still there. For you never want to feel like his presence is gone. I always wanna feel like his presence is around so that’s why I keep the clothes and stuff. Rest in peace to my brother man. SMALL: People just don’t realize what they did. And these guys with these guns just feel like they can change somebody’s world and take their kid. Copyright 2019 WLRN 91.3 FM. To see more, visit WLRN 91.3 FM.